Rimlar Staircases was founded in the garage of the family home in Melbourne in 1975. Rimlar originated by chance, when a carpenter who was working on a home extension, agreed to build a staircase for his client. From that day, the Company has continued to grow into a highly reputable, major staircase manufacturer providing a diverse range of styles and options. Now into its second generation, Rimlar Staircases is still a family run business, and the name Rimlar represents the initials of the family members. Over time Rimlar have gained a wide range of clientele many whom have been with us for over 20 years. Various clients include property developers, builders, owner builders and renovators alike. With a vision for building staircases that are not only aesthetically appealing, but practical, durable and constructed to the highest standard, Rimlar Staircases provide superior craftsmanship from a team that is flexible, knowledgeable, and will not disappoint. Rimlar have a reputable name within the industry and are committed to providing the highest level of service ensuring our clients are confident their requirements are met. We ensure our clients are kept informed of developments during every stage of the building process. 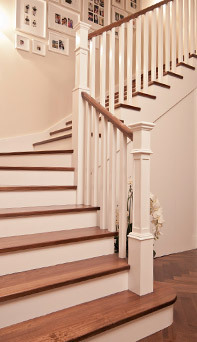 We offer prompt fast delivery of our stairs, reliable service and competitive pricing for our high quality staircases.